Vice President Biden is taking a lead role in building Democratic support for the nuclear deal with Iran, meeting with lawmakers in the House and Senate to answer questions and press the administration's arguments. The president's own party is critical to the deal: If Republicans pass a bill rejecting the deal - and with it, the waiver of U.S. sanctions against Iran - Mr. Obama will veto it, and at that point, GOP leaders would attempt to override the veto. It will fall to Democrats to prevent this, and many Democrats are concerned about the legislation. The vice president met with Democratic members of the Senate Foreign Relations Committee Thursday. The top Democrat on the committee, Sen. Ben Cardin, D-Maryland, said it was an "open and direct discussion" that covered a lot of subjects, including Congress' options if Iran cheats on the deal. But Cardin, who has not yet announced how he'll vote on the agreement, criticized the administration for beginning to implement the agreement at the United Nations Security Council before Congress has weighed in. "I think that the administration should wait till after the Congress has had its review period. 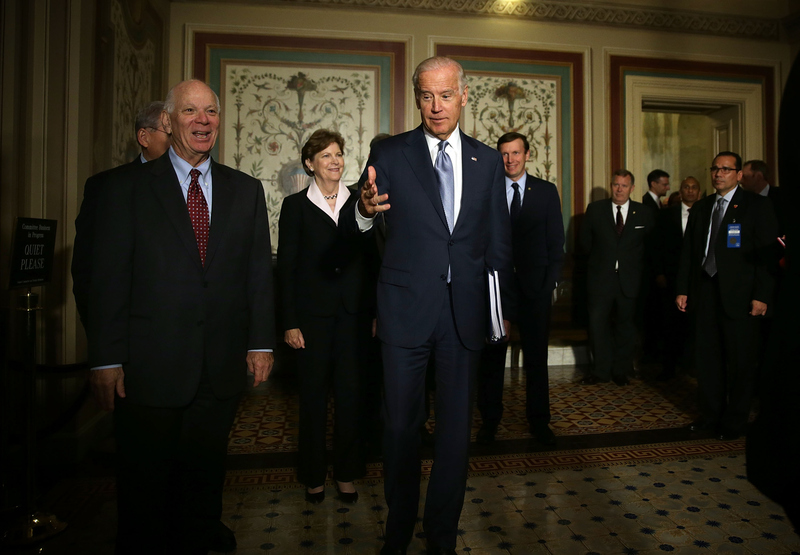 I don't know what is lost by delaying," said Cardin, who also said he raised the issue with Biden. The committee's chairman, Sen. Bob Corker, R-Tennessee, was even more critical. "I look at that as an affront to the American people, I look at that as an affront to Congress and the House of Representatives," he told reporters Thursday. Corker said he had also raised the issue with the administration. "They're going to be agreeing to an agreement that they don't even know they can implement. So I question the judgment of our president and the other members and entering into an agreement," he said. The resolution is expected to pass easily early next week, since the outline of the document was included in the 159-page document that was agreed to in Vienna by the five veto-wielding members of the Council, CBS News United Nations Correspondent Pamela Falk reported. Biden also met with House Democrats Wednesday and gave them a briefing that House Minority Leader Nancy Pelosi, D-California, praised for its "perspective" and "specificity." Pelosi herself is a fan of the nuclear agreement and is telling her colleagues as much. While she initially told reporters that Democrats would be able to sustain the president's veto, she quickly backtracked and struck a more cautious tone, saying it would be "presumptuous of me to talk about any kind of a vote that members that are just seeing." She said she wants members to hear from their constituents during the August recess, but overall, "we are in a very positive place." Mr. Obama had better hope Pelosi's optimism isn't misguided. Just minutes after she spoke to reporters Thursday, House Speaker Boehner, R-Ohio, did the same. He reiterated his initial assessment that the Iran agreement "is a bad deal" and pledged the House would stop it. "If President Obama says it's this deal or war, well that's a false choice. The sanctions were working and bringing Iran to its knees. And we're going to continue to review this, but we're going to fight a bad deal that's wrong for our national security and wrong for our country," Boehner said. He believes a majority of both the House and Senate are opposed to the deal. Congress has 60 days to review the deal before voting to approve, disapprove or do nothing about it. Lawmakers can't stop the U.S. from implementing the agreement entirely. But with a vote of disapproval, they can block the president from lifting some of the toughest sanctions against key sectors of Iran's economy that were implemented by Congress, which could cause the deal to fall apart. The reaction from Republicans was almost universally negative. So the president's best chance of stopping Congress from scuttling the deal may be to build enough Democratic support to prevent the House and Senate from overriding his veto with a two-thirds vote. If all Republicans vote to block the nuclear deal and Mr. Obama issues a veto as promised, they need just 13 Senate Democrats and 43 House Democrats who don't like the agreement to stop the president from waiving sanctions that were implemented by Congress. (The number of House Democrats assumes that the seat vacated by the resignation of former Rep. Aaron Schock, R-Illinois, is filled by a Republican). A handful of Senate Democrats went to the White House for a briefing Wednesday evening, including Sens. Joe Manchin of West Virginia, Al Franken of Minnesota, Martin Heinrich of New Mexico, Kirsten Gillibrand of New York and Tom Carper of Delaware. That group is viewed as leaning yes/sitting on the fence and still reserving judgment. The meeting lasted over an hour and was characterized by Manchin as a "very good, informative" meeting. "I'm looking for a pathway to basically to have any stability, any peace, whatsoever," he said. He said that Energy Secretary Ernest Moniz, who helped negotiate the deal, was expected to come to the Hill next week to brief Senators behind closed doors. CBS News' John Nolen and Walt Cronkite contributed to this report.